Bánh canh tôm is what I consider comfort food. 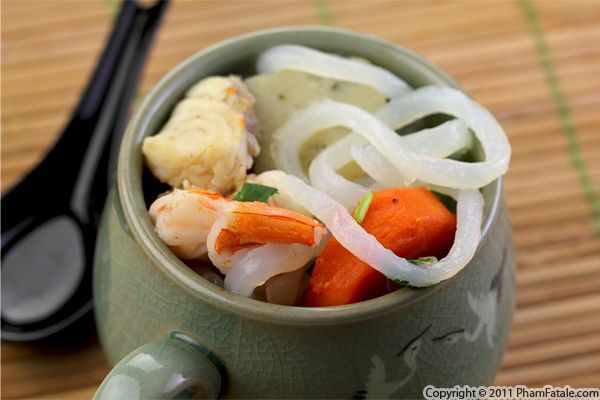 The warm broth with thick, chewy Vietnamese tapioca noodles is very satisfying. Unlike the usual comfort food you might expect, this Vietnamese soup is pretty healthy. I made this banh canh variation with "tôm" (shrimp), homemade fish balls made by our family friend, Co Nho, and pieces of yellowtail snapper. This specific fish works well because of its mild aroma and firm texture when boiled. In my opinion, the most important part of soup dishes such as pho or bun mang ga is how flavorful the broth is. I made a shrimp stock using shrimp shells. You could also add coconut milk but I didn't as I'm trying to watch my weight!